THE EDEN of Spig and Molly O'Leary was a lovely, peaceful place. There the O'Learys acquired a home, largely through the sudden generosity of Miss Celia Fairlie, an odd, vague and unexpectedly shrewd old lady who had taken a great liking to small Tip O'Leary. When Spig is already involved in preserving this idyllic spot against industrial encroachment, another, older story begins to unfold: a story that goes back into the past of Miss Celia Fairlie, concerning a mysterious death many years before. In both stories—the present crisis and the secret of the past—Spig O'Leary becomes involved; in his bitterness and anger he blunders badly and even his marriage seems threatened. This brilliant new story moves at a dazzling pace. 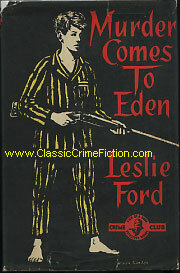 Even the greatest admirers of Colonel Primrose will forgive the author his absence from Murder Comes to Eden.